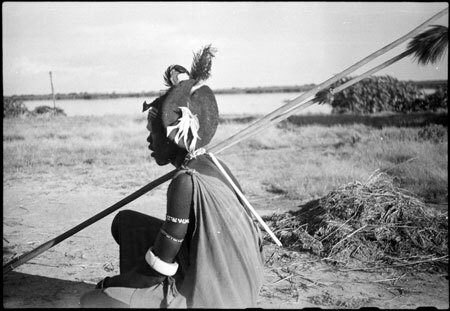 A profile portrait of a seated Shilluk youth wearing a feather head ornament, arm and neck ornaments, and two large spears resting over his shoulder. The characteristic initiation dots along the youths forehead are visible reaching across to the ear. Morton, Chris. "Portrait of a Shilluk youth" Southern Sudan Project (in development). 03 Jan. 2006. Pitt Rivers Museum. <http://southernsudan.prm.ox.ac.uk/details/2004.130.36515.1/>.